As a business in 2018, investing in a drone is an investment in success. Famously, Amazon shocked the world when they began trialling their delivery drone Amazon Prime Air in 2016. Proving that drones are capable of shipping parcels to customers in record time, with one delivery in the UK being made within 13 minutes of the order being placed. As the uses for drone technology broadens, they have become an area of investment in the tech industry, with many successful results. Here, we will explore the myriad capabilities of today’s drones, and the businesses which are capitalising on these futuristic devices and what they can do. In fact, Amazon are not the only business employing drones for the purpose of faster, more efficient and ultimately cheaper deliveries of goods to customers. Google’s parent company Alphabet has been working on Project Wing in Australia, delivering Mexican food and pharmaceuticals at 120km/hour in partnership with Guzman Y Gomez and Chemist Warehouse. Customers who live over 40 minutes drive from their nearest branch benefited from this successful trial. Not to be left out, the Chinese Company Alibaba has also advanced into food delivery with their service Ele.me, currently available only in Shanghai. In Iceland, an Israeli firm called Flytrex reduced delivery time from 2 hours to 4 minutes using their drone service. Traditional delivery firms are in on the act as well. UPS have a device which launches from an electric van containing a charger. So though the drone can only fly for 30 minutes at a time, it has helped the company reach remote locations with greater ease at a fraction of the cost. Royal Mail in the United Kingdom has also introduced the technology to access their most isolated customers who are often on far-away farms or on tiny islands. Not to be outdone, DHL has introduced the “parcelcoptor,” with similar results. Beyond food and goods, Zipline has been using the technology to fly blood across Rwanda, closing the gap between supply and demand for blood transfusions and saving lives. The first of many examples of the technology being used for the benefit of mankind. But perhaps the ultimate in deliveries, is the Dubai Roads & Transportation Agency, who are trialling the passenger drone. Able to carry one person weighing up to 100kg for a 30-minute journey, which is inputted by the passenger upon embarkation. Clearly, the most famous use of the drone still has brand new developments underway. Perhaps the other obvious use for drones, which is still providing big business in 2018, is for photography. Whether that is aerial shots of a property for a real estate agent, drone footage of a sports game for a big channel, or stunning panoramas of a wedding day or other special event. It is safe to say that with a drone and a decent camera, there is money to be made. Thanks to the size and speed of modern drones, and their improved photography capabilities, the business of surveillance is being revolutionised by the technology. Farmers are using the devices to round up cattle, whilst authorities in Africa are tracking down rhino poachers using their drones, fitted with infra-red and cameras. A company called Sunflower Labs have invented a device marketed towards homeowners and businesses with property. It is linked up to motion sensors, so when an intruder is sensed, the drone is programmed to take to the air to capture footage of the break-in, which is then beamed to your smartphone and to the police. Human Resources companies and engineering and construction firms are using this technology to ensure that their workforce is on task. Surveys have become easier and safer thanks to drone technology. Nowhere is this more true than for the property market. Gone are the days of having to scale a roof to investigate damage to the tiling, now the drone does that for you. Drones fitted with thermal sensors can even tell you how well insulated a roof is, giving the salesman some extra ammo for his pitch. In the UK, Balfour Beatty saved £8000 by conducting recent bridge inspections via drone photography. EasyJet is doing the same on their planes, commending the technology for improving safety and efficiency. Again, farmers are benefiting here, as specially equipped drones can feed back on soil hydration, insect infestations and crop progress. In 2018, the newest development in this field is the underwater drone. The introduction of this technology has allowed environmental assessments, inspections of pipes and boats to proceed with ease. Now we come to the businesses where drones can have a huge impact on human life. Disaster relief has been greatly aided by the technology in many ways. Police agencies in the UK have begun to use the technology with great success to locate missing people, track criminals and survey traffic accidents amongst other things. The Brecon Mountain Rescue Team have vastly reduced the number of hours they spend searching for lost hikers, thanks to the combination of drone technology and infra-red and night vision. British Telecom has launched a drone which offers temporary internet and cellphone coverage to battlefields, disaster zones and hard to reach areas. With improved communication, relief efforts run more smoothly, saving more lives. Of course with all this said, the most lucrative industry to enter in relation to drones, is that of teaching people how to use them. With some courses costing up to $2000, there is money to be made in training a workforce in the use of this technology. 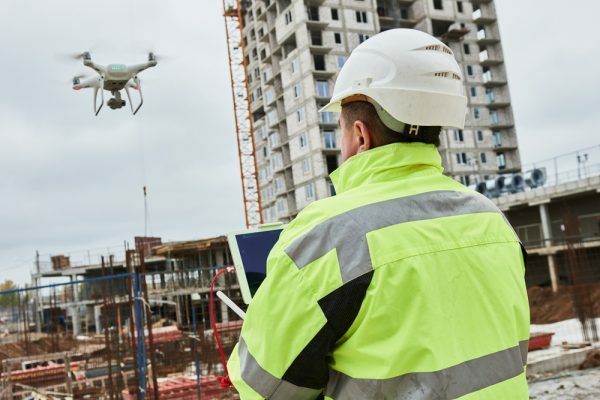 As construction businesses, farming businesses, police departments and many more accept drones as an inevitable part of their future, more and more students will need to be schooled in the intricacies of flying these devices. These are the 6 most successful business areas, where drones are becoming indispensable for 2018. However, as technology develops and becomes smaller and lighter, the sky is the limit with what can be mounted on to a drone and flown at speed. Sally is a freelance writer, blogger and copywriter with a background in fashion. She loves writing on topics as diverse as finance, travel, health, food and music. When she isn’t tapping that keyboard you’ll find her planning her next trip.